According to a BBC report, the XO also known as the $100 laptop, is soon going into mass production 5 years after it was conceptualized. The final round of beta machines (B4) have been built and deployed. 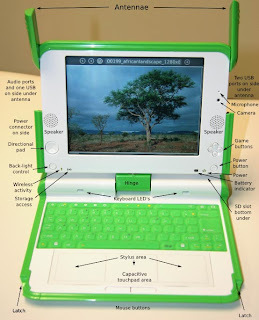 The One Laptop per Child (OLPC) is the brain child of Nicholas Negroponte (he's also the chairman). Together with a core of Media Lab veterans,he founded the OLPC non-profit organization. He is currently on leave from MIT. Designed in collaboration between experts from both academia and industry, the machine should be in the hands of children in developing countries by October 2007. The countries that have signed up to buy the XO include Brazil, Argentina, Uruguay, Nigeria, Libya, Pakistan, Peru, Rawanda and Thailand. I know that it is meant for children in developing countries, but I won't mind paying a little more to get my hands on one. I really like some of the features on it. First of all, it's water proof and shockproof. Secondly, it can be recharged by using a solar panel, a hand crank, a foot pedal or a pull-string recharger. Other features include a screen that can be adjusted to view in sunlight, wifi and built in digital camera. The laptop doesn't have any hard disk and instead has 1GB of flash memory, which can be expanded. Our nearly $1500 laptop does not have all those features. Check out the video of Chief software engineer Chris Blizzard talking about some of the features of the XO.